Over the next couple months we will be asking all of our partners to help us with a very special project. Each year at Christmas we distribute "Manna Fest " bags. Each bag will feed a family of 6 for a week at a cost of only $10.00. Please pray about how you and your family can HONOR OUR HEAVENLY FARTHER. Late December 1967 I began a journey in Southeast Asia (Vietnam) that would change my life forever. While there I experienced something that I did not know at the time would impact my life even today. Sometimes while out on different operations the weather would prevent us from receiving supplies and we would go maybe a day or two without food. My hope at the time was that I KNEW when the weather cleared we would receive food. That experience has helped me to understand the conditions here in Nicaragua that Pam and I work in everyday. Unfortunately the people here in Nicaragua don’t have that same hope. BWCM has been working for over 16 years towards eliminating hunger. Some days it seems as if we are making progress and other days that we are losing ground. Pam and I just continue to be obedient to GOD and trust HIM daily to meet the needs of the people of Nicaragua. 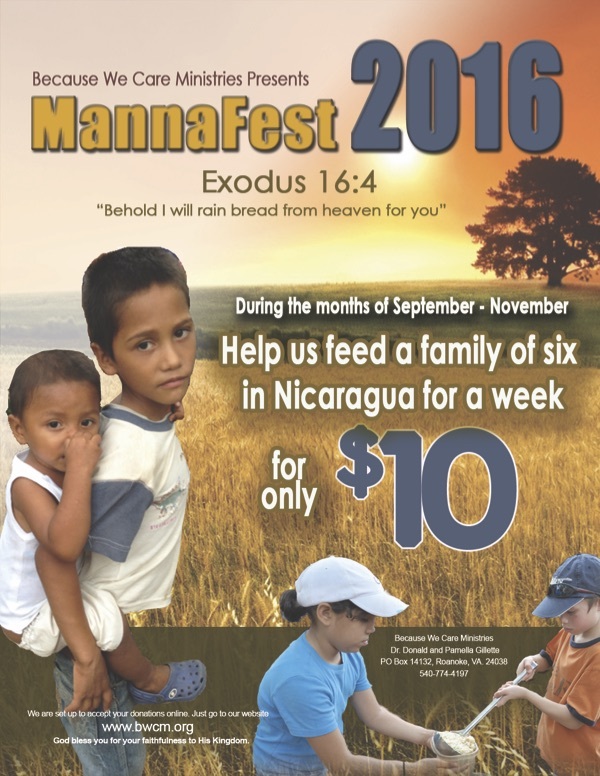 With that being said we once again are launching our annual food drive, Manna Fest. 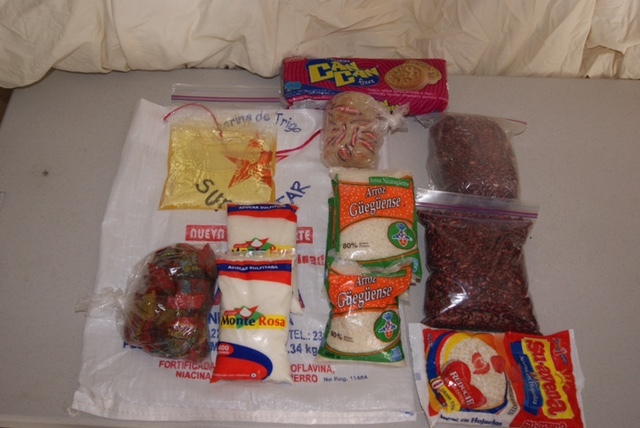 Over the next couple months we will partner with many friends and churches to provide food bags to hundreds of families during Christmas in the Somotillo area. For those that are new to this program, these food bags will provide food to a family of 6 for up to a week. April 17, 2017 I will be leading a team to THE HOLY LAND. I would like to invite you to join us on this "Once in a Lifetime Experience" to see the very places where Jesus walked, taught and lived His earthly life. Please feel free to contact me if you would like more info. Hey everyone! KJ, Emma, and Carissa here! Today was an awesome day. It was also our hottest day so far, but we’ve been keeping cool and staying hydrated. It’s hard to believe our week is almost over. We’re having a pretty great time. Carissa is going to tell everyone about our day! Today, we went to El Puma to visit Michael and his family. Some of the team finished painting his house, so it is now very blue, while the others either handed out coloring pages or participated in an intense game of soccer. At first, there weren’t many boys to play soccer with— most of the girls liked coloring better— but they began showing up out of nowhere to play and joined a random team, making it difficult to know who to pass to. For lunch, we had a very American meal— hamburgers and French fries. We also celebrated the birthday of a man on the other team. There were balloons taped to the ceiling of the dining room and Mama Maria and the other cooks made cupcake-style brownies for everyone. There’s a bet going right now to see if anyone will get the privilege of carrying out a birthday custom from down here for him— cracking a raw egg on his head and dumping a cup of flour over him. After lunch, we rode out to another village. It took a while for people to arrive, but then we were busy playing football and soccer, blowing bubbles, painting flowers and cats and butterflies on hands and faces, and handing out medicine. KJ, Emma, and I then got to meet a family making tortillas for dinner. It was interesting to watch them flatten the dough, let it fry, and then add it to a large stack that was all for tonight. Tomorrow they will be getting up at 3 in the morning to make more tortillas for their breakfast! I also got to help ladle food into the containers— which ranged from plates and bowls to pitchers and buckets— of the kids, mothers, and grandmothers who lined up to get some of the stew we cooked. It was humbling to see them get so excited over a scoop of stew, when we have so much food at home. We’ll see you tomorrow with another update! Everyone has finally pooped…so thank you for your prayers. Tomorrow we have a 2.5 hour hike to a village. On Friday, some people will be laying a foundation for a brand new home in Las Portillas. A pastor has lived there for many years, but we just saw photos today of what used to be his house. It was completely wiped out in wind storm. The end of our week is shaping up to be a lot of fun…with some hard work mixed in. Hola! This is Noah Doody. Yesterday we painted Michael’s house. So our work today was pouring the cement for the floor of the house. Every bag of cement was mixed with 12 buckets of gravel and 2 buckets of water. We had around 11 guys all working together to lay the cement down. Even some of the local kids came over and helped with the process. It took us about 2.5 hours to complete the flooring. It would have not been possible to do it in that short amount of time without the help of the local men and boys. It was really awesome to see the joy on Michael’s face after we had finished. He truly cherished the help we gave him and the house that we helped build. After laying the cement we took a short drive down the road to see where Michael lives currently. He followed us on his bike. When we pulled off the road it was amazing to see the literal shack Michael and his family live in. Tin sheets and plywood made his walls and roof. It was just so incredible to be apart of building Michael’s new house and to see how much of a blessing we could be on his life. Buenas noches; this is Brynne Dillingham here to fill you in on the work that the women did for the morning. After breakfast, we went to the village of El Larado. Like yesterday, we interacted mostly with the children, except this time we worked at a church. We played games with them, sang worship songs in both Spanish and English, then concluded with singing the "Monkey Song, one that neither I nor many of the other American people knew but we could obviously see the kids LOVED it. After this, the kids exited the church and on their way out we gave them each a gift of clothing, in which they appreciated more than anything. Concluding our time with the villagers, we played outside games such as soccer, blowing bubbles, and tossing around a beach ball. After we returned back to Casa de Shelly to refuel with some lunch, we headed back out to a village called El Ojoche together as one team. Similar to yesterday, we were able to provide the community with a large pot of chicken and rice soup and spent lots of time loving on the families there. We played American football, painted lots of tiny fingernails, colored in color books and did some face painting. Towards the end of our time in the village, some of the students acted out the story of David and Goliath, a story that few had heard. I think they got a kick out of seeing Katriel throw a "stone" (tennis ball) straight to the forehead of our "Goliath" sending him down to the ground. It was another beautiful day in Nicaragua. Continue to pray for us as some of our students head to the radio station tomorrow to share their testimonies and lead us in a time of worship. Hey everyone. KJ and Emma here for our first blog update during our second trip! 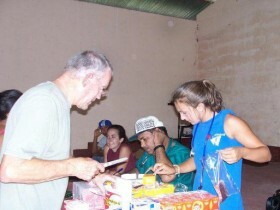 We arrived in Somotillo, Nicaragua Sunday afternoon along with all 500 lbs. of our donations. By dinner time we were settled in and acquainted with the other team from Lynchburg + Huddleston VA. We are getting along great with them! We were pretty wiped, so we all slept really well last night. After waking up at 6am we had devotions and then an amazing breakfast prepared by Mama Maria and her kitchen staff. A couple of team members from the other crew went to the radio station to share their testimonies as well as lead everyone in a few songs of worship over the airwaves. Once they got back to Casa De Shelly we split up for our morning projects. The men went into a local community to help a man named Michael build his house. They painted the exterior cinderblock walls and also put up some trim. Michael told us to pray for his mom, Bertha, who just had her appendix taken out 5 days ago. I (KJ) had the opportunity to go visit her home to pray for her. I rode on a motorcycle for the first time ever. It was awesome! Continue to pray for our team to have opportunities to share the Gospel and pray for/with those we get to meet! The women went to Pascuala and taught children the story of Daniel and the lions den and also made lion hand puppets out of brown paper lunch bags and construction paper. The kids loved it! The women spent the rest of their time playing games with the kids. Then it was time to meet back at Casa De Shelly. After lunch we went to our first village of the week called La Flor. There we cooked a giant pot of a fortified chicken and rice soup, gave 150 lbs. 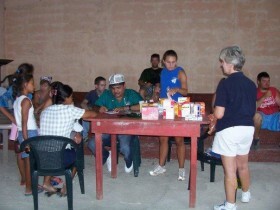 of donations to the local pastor, and set up a medical clinic for the community. We also played sports, braided hair, and painted nails. Each day we share ‘God moments’ with the rest of the team. These are times throughout the day where you witnessed the Lord moving through a person or experience. We are encouraged to share a verse that goes along with it. This helps us to see how can be applied to our everyday lives. It is inspiring to hear how the entire team noticed Jesus throughout the day. Thank you for your continued prayers and support. The students are having a blast. We can’t wait to share more great stories with you as the week goes on. What an awesome day here in Somotillo with our team from Birmingham AL and Pensacola FL. This morning we had a medical team working in the clinic with 4 Dr’s and a full support staff, one team worked on a new house that we are building in Puma and the third team was teaching English at the Baptist Church. Lots of lives being touch for the GLORY of GOD. The morning started off great as Zach and Kyle led the morning devotion. Eight missionaries went to the radio station to sing and share their testimonies. After we got back, the girls went door to door in the barrio of La Barrera. They shared their personal stories, invited them to church (Principe de Paz Baptist Church), and handed out clothes, toys, and food. Half of the boys went to the river bed and loaded the truck with sand that they will use to make concrete… the other half dug up three inches of the ground under the carport in order for the BWCM bus to fit. 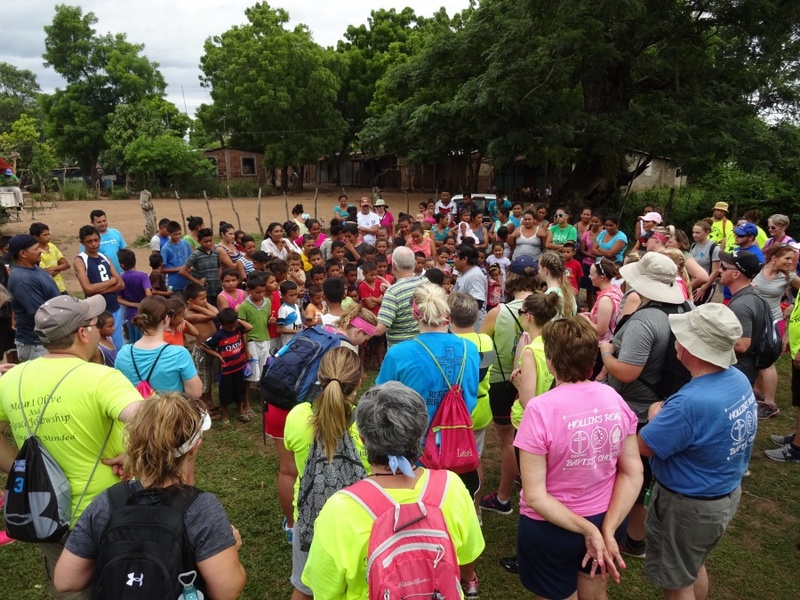 After lunch, we went to the village of Jinocuao where we served stew, played games with the children, painted nails, made balloon animals, played soccer/volleyball and shared the Gospel using the eBall. Before we left, we passed out dresses made out of pillowcases for the young girls and gave globe balls to the boys. Continue to pray for strength and boldness to share the Gospel to all we connect with. We love you. 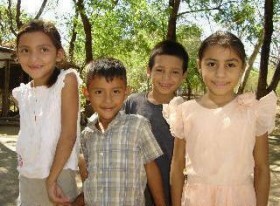 Praise the Lord, our Broadcast Nicaragua team has hit the ground running. Yesterday, when we arrived at Casa de Shelly, we visited the village of Esperanza and had a great time ministering to them. We had an incredible night during our God Moment time as the whole team shared their God Moment. Today we had an awesome full day of ministry. The guys went to the San Cristabol Volcano and loaded up a truckload of dirt for a construction project at the Casa de Shelly. Our ladies visited Laredo School. We had a great time with the kids singing songs and playing games with them. We also did a bible story skit and they colored a picture about the bible story. This afternoon we visited the village of Mata de Cana. We played soccer, threw frisbee, and served the stew to the villagers. Our highlight was the skit of Daniel and the lions den that our students acted out. Please continue to pray for our team as we go and serve the people of Nicaragua.